CAYO SANTA MARIA is a small key, 16 km (10 mi) long by 2 km (1.2 miles) wide, located in the Bahia de Buena Vista, off the northern coast of the main island of Cuba, in the province of Villa Clara. With its two neighbors, Cayo Las Brujas and Cayo Ensenachos, they together form a quiet resort destination with stunning beaches, called "Los Cayos de Villa Clara". These cayos (keys) are connected to the main island of Cuba by a 48-km (30-mi) causeway (called Pedraplen in Spanish), from the coastal town of Caibarien. These Cayos are part of a larger archipelago called Jardines del Rey (King's Garden), which is currently the most active area in Cuba for tourism development. Once completed, the archipelago should reach a capacity of about 32,000 rooms distributed in the following islands (from west to east): Cayo Las Brujas, Cayo Ensenachos, Cayo Santa Maria, Cayo Guillermo, Cayo Coco, Cayo Paredon Grande and Cayo Cruz. This Cuban archipelago may then become the largest beach resort destination in Cuba with almost twice as many rooms as currently found in Varadero. 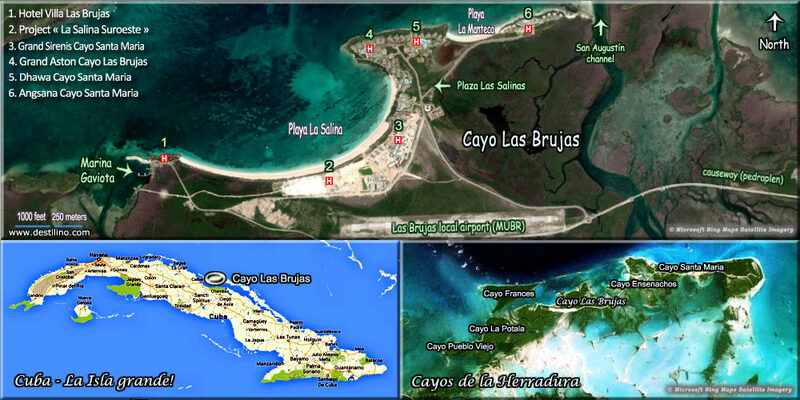 The three "Cayos de Villa Clara" (Cayo Santa Maria, Cayo Las Brujas and Cayo Ensenachos) reach more than 10,000 rooms. 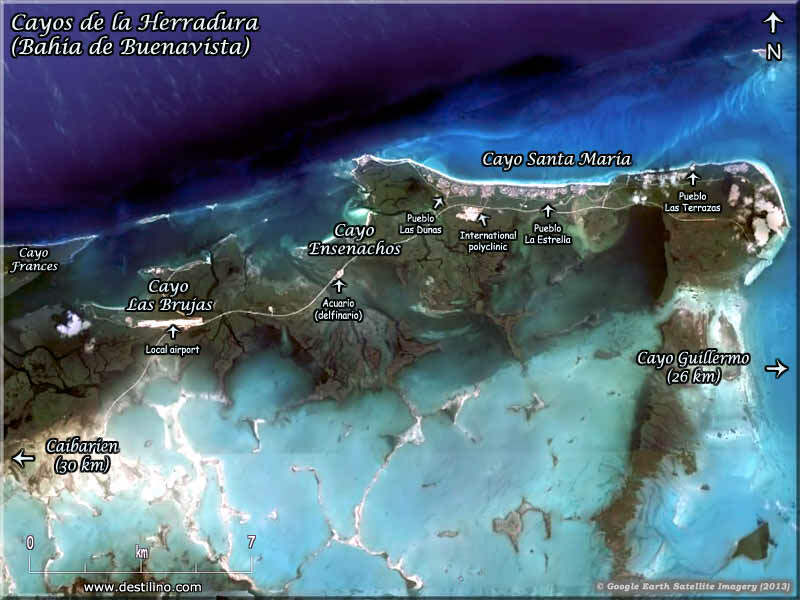 Tourism development started on Cayo Las Brujas in 1999, followed by Cayo Santa Maria (first hotel in 2001) and Cayo Ensenachos (2005). The size of the hotels vary largely from approximately 24 up to almost 1,000 room, see here a Chart of the number of rooms per hotel. Click the following link for a detailed chronology of tourism development in the Cayos of Villa Clara. Cayo Santa Maria is part of the Villa Clara province but is located only about 30 km (18.6 mi) as-the-crow-flies west from Cayo Guillermo and Cayo Coco, two other popular beach destinations in the nearby province of Ciego de Avila. Learn more about the other islands of: Jardines del Rey. We learned there’s also a project to build a water park (either near the dolphinarium or at the east end of Cayo Santa Maria), and a golf course in Dolores, a village located a few kilometers from the town of Caibarien (where starts the causeway to reach the cayos). In a short period of time Cayo Santa Maria became the second largest beach resort in Cuba, after Varadero, but despite this fast development, it remains a nice, safe and quiet little island. Cayo Santa Maria's main attraction is without a doubt its 13 km (8 mi) of magnificent fine sand beaches, divided in three sections. The beaches and hotels are all located along the northern coast of the island, while the south coast is mainly dominated by forests, salt marshes and mangroves. 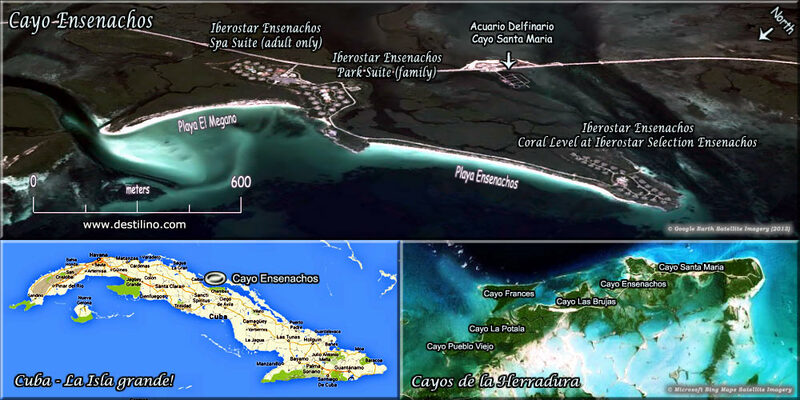 Click to see an areal view showing the position of the hotel and services on Cayo Ensenachos. 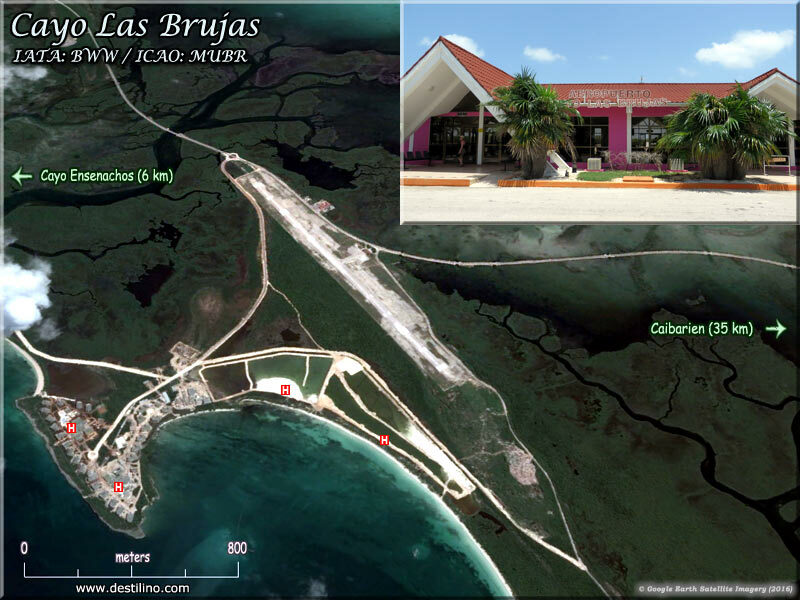 Click to see an areal view showing the position of each hotel and services on Cayo Las Brujas. 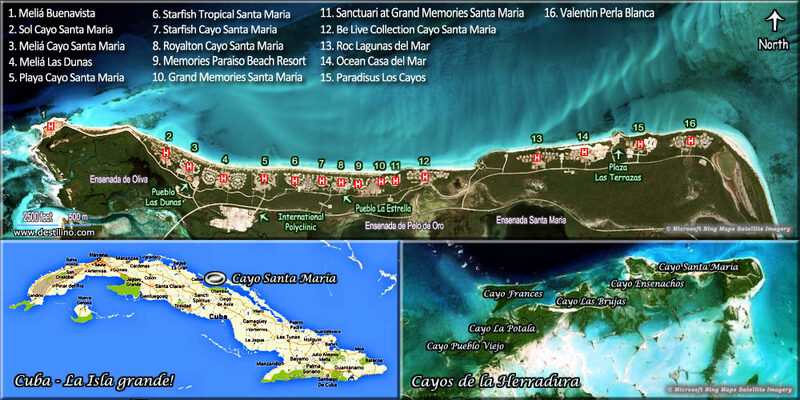 Click to see an areal view showing the position of each hotel and services on Cayo Santa Maria. There are two international airports serving the King's Gardens: the Cayo Coco Airport (Aeropuerto Jardines del Rey, code CCC) which serves the cayos of the eastern part of the archipelago (Cayo Coco, Cayo Guillermo, Cayo Paredon, Cayo Cruz), and the Santa Clara Airport (Aeropuerto Abel Santamaria, code SNU) which serves the western cayos (Cayo Santa Maria, Cayo Las Brujas and Cayo Ensenachos) and the province of Villa Clara. On Cayo Las Brujas (next to Cayo Santa Maria), there’s also a local airport for domestic flights; unfortunately the runway is too short to accommodate large aircrafts. With the nearest international airport being located in Santa Clara (the capital of the province of Villa Clara), it takes about 90 minutes by road to reach Cayo Santa maria from the Abel Santamaria Airport; the first 60 min. or so is through the Cuban countryside and the towns of Remedios, Camajuani and Caibarien, and the last 20 minutes on the causeway (Pedraplen) with the sea on both side. 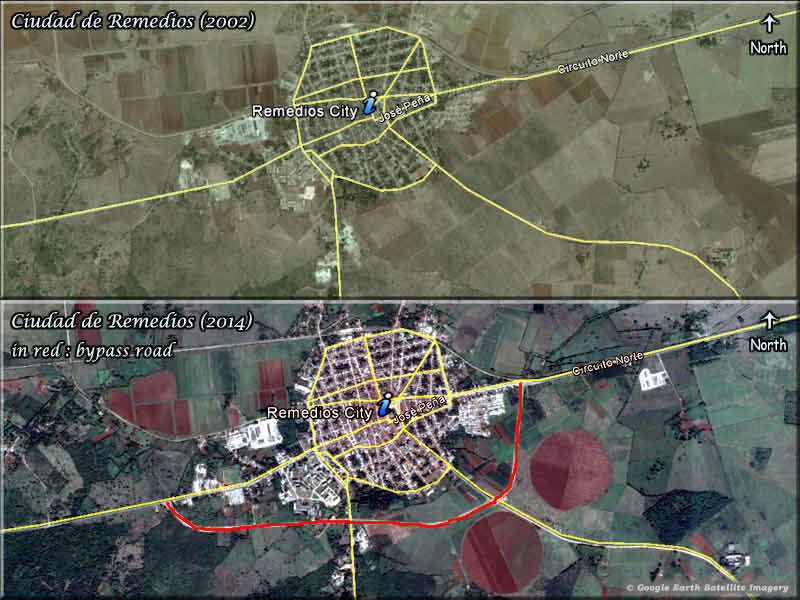 The Cuban government has recently built a new road to bypass the village of Remedios. There would also be a project to build a motorway to reach the pedraplen in about 30 minutes, which would allow reaching the cays in about one hour. Note however that the current 90-minute ride is not monotonous, on the contrary; it gives you the opportunity to visit a bit the region and admire the scenery. Besides, a local guide accompanies each bus carrying tourists to the cayos, he/she describes what we see along the way and talks about the history of the region, the local industry, and about Cuba in general. You can usually buy some drinks on board the transfer bus (or just before boarding), such as a cold beer "cerveza fria" at a cost of $5 for two beers, any currency accepted. About the causeway (pedraplen): This colossal project was the work of the company "Campaña de Las Villas". The construction began in 1989 and was completed in 1999, paving the way for the development of mass tourism in this region. It’s on September 12th, 1989, while visiting the area, the former president Fidel Castro assigned the team to start the causeway project; on December 15th, 1989, the first stone was tossed into the sea. One of the top priorities was to preserve the environment with the construction of several openings (bridges), 46 in total for a total length of 2,298 meters (7539 ft.) of bridges, allowing an uninterrupted flow of ocean currents to minimize damage to the ecosystem of the archipelago. The work has received international recognition, including an award in 2001 for its high economic effect with the least impact on the environment. It’s obvious that the 10 years of effort required to build the causeway to link the "Cayos de Villa Clara" with the main island of Cuba was opening the way to make this region an important tourist pole. Plus, Cuba needs a lot more rooms in years to come, especially since the restoration of diplomatic relations between Cuba and the United States in 2015, and talks about eventually lifting the embargo. More and more Americans may want and be able to visit Cuba in the near future.